Universities are completing ambitious revitalization projects, turning dilapidated spaces into mixed-use, live-work-play neighborhoods. Two institutions share how their initial vision turned into a community success. Unlike private-sector real estate developments, ambitious university projects nearly always reach beyond basic financial returns, as institutions invest in much more than “just a building” for their students, professors, and communities. Like a shiny silver dollar, a newly completed campus project can create a lot of buzz. Yet, the initial face value of a thoughtful mixed-use university real estate development only scratches the surface of long-term value. The true achievements of successful campus—or off-campus—transformation projects are revealed over time. Return on investment that considers things like student achievement impact, improvements in university reputation, and positive effects on the surrounding community often can be quantified only years after ground is broken and ribbons are cut. Powerful long-term outcomes beyond the purely financial are not unusual for university developments that look past the traditional notion of creating an ivory tower and toward enriching the larger community. The opportunity is clear: A vital university community, anchored by a respected, modern campus, can not only nourish the local economy, but can also add to its appeal for students, parents, and world-class faculty alike. Creating inviting spaces for industry can not only drive research innovation, but also can boost university rankings. Sounds good in theory, but is it realistic to expect such big-picture rewards? Consider this tale of how two very different universities both achieved long-term positive impacts on their surrounding communities, student populations, and their institutions as a whole—impacts that were not yet quantifiable when their new buildings opened their doors. Both The Ohio State University, Columbus, and the Georgia Institute of Technology, Atlanta, answer the question of big-picture rewards with a resounding yes—because they’ve achieved such rewards themselves over the past decade. Back in the 1990s, Georgia Tech had an ambitious vision: transform a dilapidated, eight-acre site in Atlanta’s depressed Midtown district into a vibrant urban village and gateway to the campus. The result: The Institute was able to turn a neglected corner of urban Atlanta into a hot spot and national technology cluster, while transforming the institution’s business school from a regional player to a nationally ranked, competitive destination. Meanwhile, in Columbus, The Ohio State University sought to revitalize its surrounding University District community to improve the campus experience. A decade later, the emergence of the vibrant, mixed-use, live-work-play neighborhood development with high-quality housing options for students, faculty, staff, and local residents has also improved corporate and community engagement. Thirteen years ago, Business Officer called Georgia Tech’s Technology Square development “one of the most impressive urban and academic revitalization efforts in the country” (Business Officer, “Georgia Tech Squared,” January 2003). The project required jumping 14 lanes of interstate, which had for approximately 40 years cut off the university from Atlanta’s Midtown district, to convert eight acres of underused land into a 1.4 million–square-foot, mixed-use urban village. Georgia Tech’s Crum and Foster data center blends high-tech with traditional design. Georgia Tech’s leadership envisioned a live-learn-work-play environment for the multiblock campus that would fuel innovation by nurturing natural connections between business and academia, and give university members space to connect with the larger commercial, government, and nonprofit world. It also looked to create an inclusive and supportive neighborhood for its economic development and business outreach efforts, as well as a highly visible location for continuing education and alumni engagement. 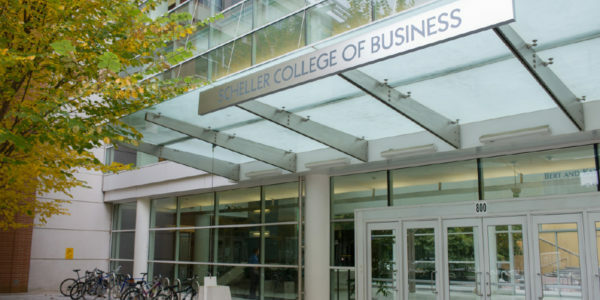 Another priority was to create a new facility for the Scheller College of Business. Georgia Tech’s Hotel and Conference Center overlooks Midtown Atlanta, and includes 23 meeting rooms and 252 guestrooms. Tangible results. Today, the outcomes have far exceeded the Institute’s expectations. As of July 2016, the eight-block Technology Square campus was nearing three million square feet of mixed-use space, including the new NCR Corporation’s world headquarters under development; and Tech Square Lab, an incubator, seed fund, and 25,000-square-foot working and corporate innovation space. Tech Square, as it is now known, is home to eight buildings housing the Scheller College of Business; a state-of-the-art facility for the Institute’s professional education program; other amenities such as the Georgia Tech Hotel and Conference Center; and a Barnes and Noble bookstore, along with restaurants, shops, condominiums, and office space. With more than 100 startup and innovation companies focused on interdisciplinary research, Technology Square has helped the university build its reputation as a premier technological university by providing a place for public-private collaboration backed by world-class research facilities. Midtown has become a thriving area hosting academic, public-sector, and private-sector organizations with the buzz of a vibrant technology hub. This was all made possible by the university’s willingness to invest in neighborhood transformation. As of summer 2016, 18 high-rise projects were under construction in Midtown Atlanta, and Tech Square is rapidly solidifying its position as one of the country’s top innovation districts. Building on success. With a solid foundation in place, Georgia Tech is well-positioned to launch the second phase of Technology Square. A private developer will build the approximately 750,000-square-foot Coda tower, which represents a $375 million investment. It will house 620,000 square feet of office space; an 80,000-square-foot High-Performance Computing Center operated by Next Tier HD; and will also include retail amenities once complete. Georgia Tech plans to occupy approximately 50 percent of the Coda building. The project is estimated to have an economic impact of $813.8 million as well as creating 2,100 jobs during construction and 2,400 jobs on site after completion. The university also envisions a long-term boost to innovation in the area. In addition, the Georgia Tech Foundation recently purchased the approximately 290,000-square-foot historic Biltmore office building. Steadily rising enrollment. Enrollment grew from 11,550 undergraduates and 5,300 graduate students enrolled in 2004–05 to an estimated 15,150 undergraduates and 9,900 graduate students in the 2016–17 academic year. Business growth. Technology Square has attracted 15 industry innovation centers for leading companies such as AT&T Mobility, Panasonic Automotive, Southern Company, Delta Air Lines, The Home Depot, Coca-Cola Enterprises, NCR, and ThyssenKrupp Elevator Americas. Georgia Tech’s Advanced Technology Development Center is one of the country’s most highly regarded technology incubators, facilitating nearly 170 high-tech startups since 1981. It was named one of the top 12 “Incubators Changing the World” by Forbes, and its graduates have collectively raised more than $2 billion in investment capital. The Institute’s VentureLab commercialization program has nurtured more than 300 startups and was named by UBI Index as the No. 2 university-based incubator in the United States. Local development impact. Between 2000 and 2015, Midtown added $4 billion worth of new development; another $3 billion is projected to come online in the next few years. Within blocks of Technology Square, more than 1,700 apartments and condominiums have sprouted up since 2004, with more in the works. General Electric has announced plans to build a $3 million global digital operations center in the area, and KeySight Technologies plans to create a $14 million software development center in Tech Square. Kaiser Permanente also is planning an IT campus in Midtown. Nearly 100,000 square feet of retail development has also been announced. Town-and-gown collaboration. Georgia Tech has engaged in ongoing collaboration and creative technology investments with area business partners, including a popular internship program, a lunch-and-learn series, and co-working opportunities. Also noteworthy is the Global Center for Medical Innovation, a Georgia Tech affiliate launched in 2012, the Southeast’s first, comprehensive, medical-device innovation center. The Scheller College of Business joins seven other buildings to form Tech Square. National reputation. Georgia Tech’s Scheller College of Business has gained a national reputation and student base, and its quantitative analysis and management information systems programs have received top spots in U.S. News & World Report’s annual rankings. The Technology Square project has also received national attention, earning the prestigious “Award of Excellence” from the Urban Land Institute, upon completion. The Association of University Research Parks named Tech Square its “2014 Outstanding Research Park Award” winner, and the Association of Public and Land-Grant Universities named Georgia Tech its “2014 Innovation Award” winner. New or reconstructed homes are sold to moderate-income families. Ohio State’s Columbus campus has been a center of academic achievement for 144 years. But back in 1995, the distressed neighborhoods surrounding the campus kept more than half of the school’s 48,000-strong student body living in the suburbs rather than on or near campus. Instead of separating the university from the community, university leadership decided to invest in the University District, encompassing approximately 300 blocks in about 2.5 square miles near Ohio State and home to more than 30,000 residents. Revitalizing the district with academic, office, retail, and housing facilities, while improving neighborhood housing, would enhance the overall university and community experience and attract students and faculty. The university’s strategic plan included the South Campus Gateway, a major new mixed-use development that could stimulate private real estate investment and help create an attractive neighborhood on the university’s south side. In addition, the university wanted to improve housing near the campus and create safer, livelier neighborhoods that would appeal to faculty, students, and long-time residents alike. Visionary collaboration was vital to this endeavor, so the university partnered with the City of Columbus to create Campus Partners for Community Urban Development, a nonprofit group to manage the ambitious real estate projects. Their successful collaboration culminated not only in the profitable South Campus Gateway, but also in the Weinland Park neighborhood initiative on Ohio State’s east side that has since become a national model for town-and-gown urban revitalization. Initially, Campus Partners facilitated the acquisition of the nation’s largest portfolio of low-income housing—the Broad Street Portfolio of 1,335 Section 8 housing units located in the University District and in neighborhoods throughout the City of Columbus—by a nonprofit, affordable-housing management company committed to neighborhood stabilization. In 2006, community leaders, Campus Partners, and the City of Columbus together developed the Weinland Park Neighborhood Plan. Many partners—private, public, and philanthropic—joined Campus Partners and the City of Columbus to address a wide range of needs in the neighborhood including public safety, education, workforce development, health, resident engagement, youth development, and housing. Today, Weinland Park is a showplace for integrating affordable and market-rate housing in a diverse and appealing community. South Campus Gateway, meanwhile, now comprises four buildings on a 7.5-acre site with more than 225,000 square feet of retail space, 88,000 square feet of offices, 184 apartments, and a parking garage with 1,200 spaces in Columbus’s now-lively High Street Corridor. The project is anchored by a flagship university bookstore, an eight-screen film center, and a unique array of restaurants. Several organizations have validated Ohio State’s approach—the American Planning Association awarded Campus Partners a 2010 National Planning Excellence Award for Implementation, and South Campus Gateway was selected as a finalist in the 2010 Urban Land Institute’s Awards for Excellence, among other recognition. Campus Partners is already hard at work on the next phases of investment in the University District. 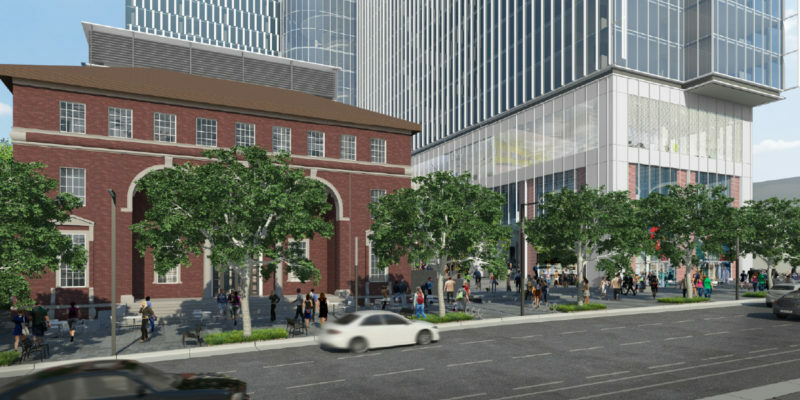 In June 2016, the organization unveiled plans for a complete remake of the intersection of 15th Avenue and High Street—the historic entrance to the university—to include retail, office, housing, a 150-room hotel, and a public University Square. The collaborative planning effort works congruently with Ohio State’s vision on the west side of High Street, where an Arts District Master Plan will one day showcase music, art, and theater programs from across the university. This collaboration is thought by some to be a once-in-a-generation opportunity to provide connectivity between the university and the community—creating a place for art and culture. Stable neighborhoods and rising property values. Property values in Weinland Park have risen by as much as 10 percent since the last assessment, after decades of decline; and residential values rose by 10 percent between 2011and 2014, according to county property tax authorities. Economic development impact. The $154 million in public and private dollars invested in the development of South Campus Gateway created an estimated 500 to 700 new jobs and spurred more than $300 million dollars of private investment in new housing, retail, restaurants, and entertainment venues. 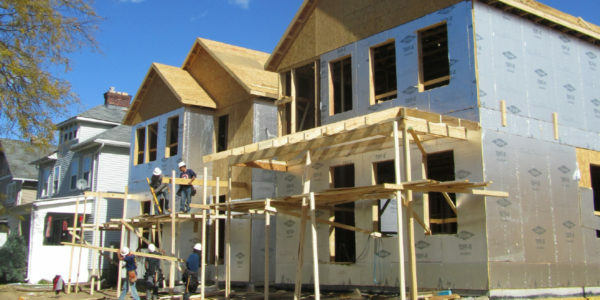 A $43 million Neighborhood Stabilization Program grant from the City of Columbus enabled the renovation or construction of 20 homes in Weinland Park, near The Ohio State University. Reduced urban blight. Following the Broad Street Portfolio acquisition and redevelopment work, a $4.3 million Neighborhood Stabilization Program grant from the City of Columbus in 2012 enabled Campus Partners to facilitate the renovation or construction of 20 Weinland Park homes that have been sold to moderate-income individuals and families—further reducing neighborhood blight. 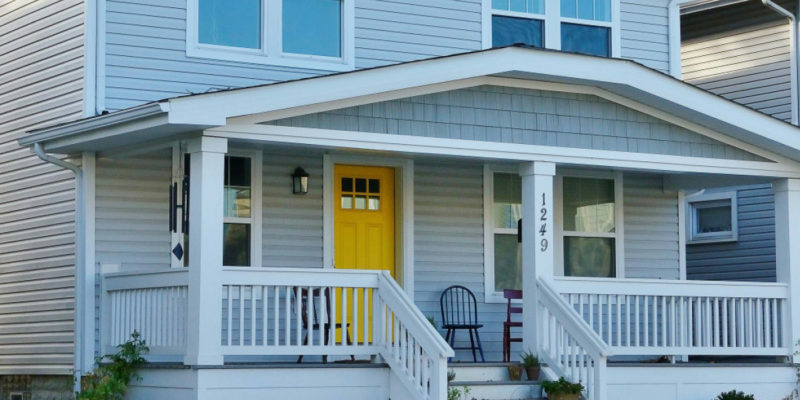 Campus Partners also is working with partners in the development community to convert neglected industrial and residential properties into affordable and market-rate housing. Engaging neighborhoods for Ohio State faculty, staff, and students. In the past, students had limited housing options. Today, thousands of apartment units have been built or are underway by private developers, with market-rate rents that allow for high-quality construction. A 2008 study commissioned by the University Community Business Association found that students were living in University District in numbers not seen since the 1980s, and that the housing occupancy rate was more than 99 percent. The number of faculty and staff taking advantage of Ohio State’s housing incentive program has risen to its highest level, an indicator of improved neighborhood quality. Social benefits beyond real estate. With its ear close to the ground in University District, Campus Partners has helped Ohio State more deeply engage with residents. For example, an Ohio State pediatrician and an infant health specialist are tackling infant mortality in Weinland Park and elsewhere through a new nonprofit, Moms2B, with support from The Ohio State Wexner Medical Center. Neighborhood stabilization helped Weinland Park convince a major grocer to reinvest in the community with a new store, and Campus Partners also helped reduce crime by buying out local “carry-out” corner shops that were magnets for illegal drug and gun sales. Self-sustaining community institutions. Campus Partners was initially funded by Ohio State and the city. Today, the organization’s operational budget is funded entirely by revenues from South Campus Gateway. The entity continues to collaborate closely with the City of Columbus, as well as neighborhood organizations like the Weinland Park Collaborative and Weinland Park Civic Association, and the University District Organization. At each of the two universities, the outcomes of their ambitious visions have become clear over time in ways not immediately visible when the first phase of development was completed. Critical to these outcomes were some key factors that should be top of mind for other institutions considering investing in major real estate development projects. Visionary leadership is a must. Both Georgia Tech and Ohio State—and their communities—benefited from far-sighted institutional leaders who recognized that bold transformation does not happen overnight. Nor does it happen in a vacuum: Decades of collaboration with community partners may be required to truly extend campus appeal beyond its traditional confines. Look beyond short-term cost and value, and hunt for hidden opportunity in underutilized space and land. For example, if more residential areas are needed, think about the revenue possibilities of creating new dorms that combine opportunities to dine, work, and shop, too. Focus on long-term results as much as immediate project goals. Institutions of higher learning face intense scrutiny when it comes to any new expense—short-term value projects need not apply. This sensitive budget climate means dollars spent today need to drive deep value tomorrow. For example, a cutting-edge new research building may be attractive and highly usable today, but, with the right design, it could also deepen beneficial ties with industry in the long run. Build a solid financing structure. State support for public universities has been falling for more than a decade, and private schools can only stretch tuition so far. As Business Officer has reported, between 2008 and 2013, states cut appropriation support by more than 20 percent per full-time equivalent student in the median public institution, and cut support to the median public research university by more than 26 percent (Business Officer Plus, “Public-Private Partnerships: It’s The Right Time.”) Intricate public-private partnership (P3) structuring and financing is, therefore, becoming indispensable. Creative capital planning requires stakeholders to align behind a shared vision, from boards of trustees and student councils, to local community associations, and state agencies. Ohio State’s South Campus Gateway development was funded by a combination of university capital, tax-exempt bonds, New Markets tax credits, tax-increment financing, and city-state infrastructure grants. 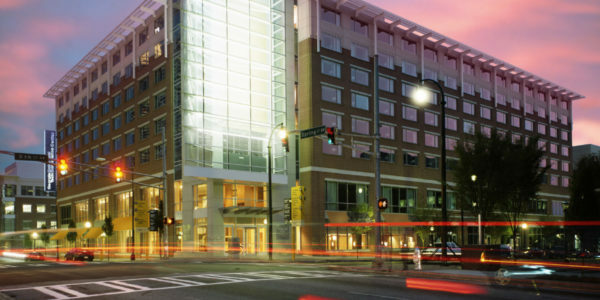 At Georgia Tech’s Technology Square, the project team created different financing structures for each component of the campus. Dollars aren’t the only metric that counts. Carving out space that can be rented by private parties is certainly one way to leverage mixed-use real estate to generate revenue. But, that is just a small piece of the potential benefit. For example, if your campus was surrounded by a more vibrant community, filled with attractive amenities and post-graduation live-work-play opportunities, could that in turn foster recruitment of higher-caliber students and faculty? When the answer is yes, that increased stature can be a powerful metric. 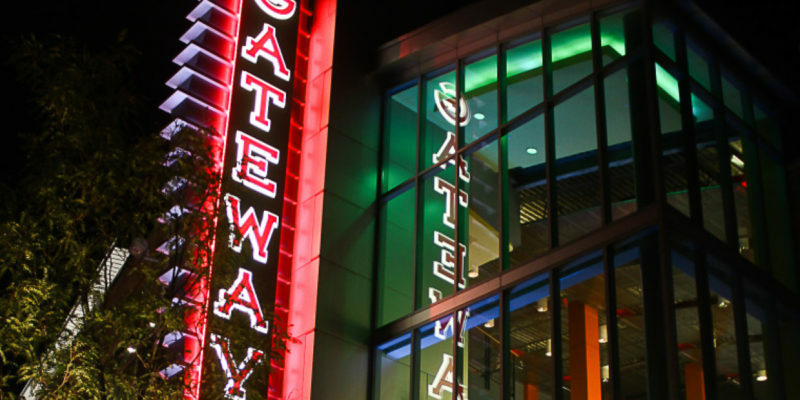 The Gateway Film Center is one of the many venues accessible to the OSU campus community, and residents of the nearby areas. Form thoughtful development partnerships for streamlined project management. Planning, financing, and executing a years-long development project requires working with a team of experts you can trust and that will keep the school’s best interests in mind, from creating achievable time frames, arranging complex P3s, and selecting a master developer, to brokering site acquisitions and leasing, and managing construction and project delivery. In addition to partnering with service providers, both Georgia Tech and OSU’s experiences illustrate that community-based alliances can also be vital to success. As Georgia Tech and Ohio State have found, world-class institutions can win recognition not only for great research, but also for their business and economic impact, appealing environments, and walkable neighborhoods accessible to the campus community and residents of the surrounding areas. Attractive retail, dining and lodging options give students, faculty, and the community as a whole more reason to spend their dollars on campus and in adjacent neighborhoods. 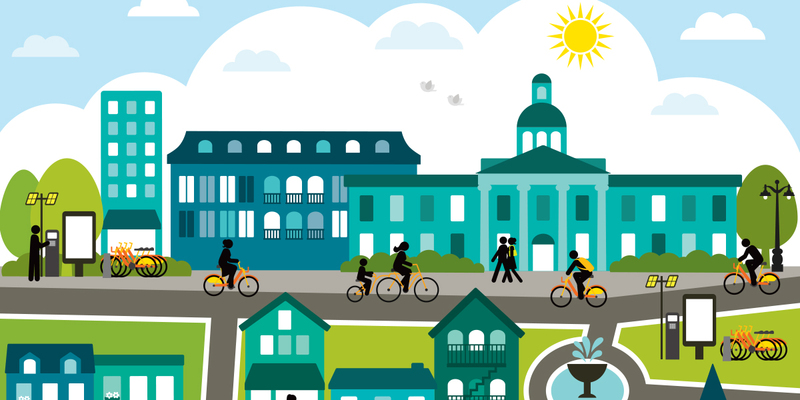 Stronger connections between public and private innovators can help build reputation, attract private investment and create mutually beneficial town-gown relationships. With Ohio State and Georgia Tech as inspiration, it is becoming increasingly clear that university transformation projects can support revenue goals as well as improve campus experiences when project stakeholders adopt a long-term view. The challenge, of course, is that even the most brilliant renderings and savvy budgeting won’t win administration and trustee support. A well-thought-out plan, backed up by realistic financing strategies and a long-term view, is essential. Fortunately, in the academic world, taking the long view comes naturally. Academia is all about lasting ideas, and the notion of a university spurring business innovation and community engagement is a proven winner. HERMAN BULLS is vice chairman, Americas, and international director and founder of JLL’s public institutions business unit, Washington D.C. AMANDA HOFFSIS is president, Campus Partners, and senior director of planning and real estate, The Ohio State University, Columbus; and STEVEN SWANT is executive vice president for administration and finance, Georgia Institute of Technology, Atlanta. Kevin Wayer, co-president of JLL’s public institutions group; and David Hock, co-leader of JLL’s higher education group, also contributed to this article.